Mark Garrett Cooper, in Love Rules -- Silent Hollywood and the Rise of the Managerial Class, presents an intriguingly specialist link between American socio-economic development and the rise of the motion picture. Taking the archetypal Hollywood heterosexual white love story as his example, the author argues that ‘Hollywood cinema helped change who could rule and how rule would be conducted’(216). The ideology of the love story, he argues, was organised by a managerial class who sought to use it to illustrate their emergence, mastery and ultimate dominance. This main thesis is spread over four chapters. After a reasonably lengthy introduction (where the author cites the over-rated Sleepless in Seattle as a modern example of the Hollywood love story uniting the heterosexual couple across space and time), subsequent sections deal with ‘The Visual Love Story’, ‘The Public’, ‘The Influence Industry’and ‘Ethnic Management’. These chapters (around forty pages each) are supplemented by a conclusion and copious notes to each chapter, showing an abundance of consulted reference material. Despite this, as with Early Cinema -- From Factory Gate to Dream Factory, the hypothesis put forward is clouded in a rhetoric that proves rather too dense. True, the subject-matter and Mark Garrett Cooper’s ‘take’on it is far from straightforward, but even the introduction to the book makes the initial impression that this will be a hard-going volume. ‘The Hollywood love story’, it declares, ‘posed a question of authority and answered it’(5). It is really without possible debate that the inclusion of the romance was (and still is) key to Hollywood storytelling, but if all genres and styles of film-making (especially within the ‘Classical’timeframe that the author discusses) were reducible to less an expectation or desire but a pure cast-iron certainty, films would long since have lost their appeal. It is the author’s reluctance to frame his arguments in a clearly ordered fashion and the way he challenges (or simply dismisses) influential critics that makes Love Rules’ less of a powerful polemic requiring a sea-change of interpretation but a book whose ultimate merit is rather more questionable. An example of this unnecessary double standard of challenging existing criticism whilst failing to provide any coherent substitute appears as early as page twelve, where Mark Garrett Cooper refers to David Bordwell’s ‘sweeping critique’and that Bordwell’s [narrative] model falls short when it fails to recognize that the love story does not happen ‘in space as much as to space’(12). So, an alternative ‘reading’is posited here by Mark Garrett Cooper, who does not, however, provide a logical substantiated argument for this peculiar ‘to space’concept. Another potential problem for the author is his analysis of leading filmic texts, chosen from Hollywood’s silent screen era. Thus, when discussing The Crowd (King Vidor, 1928), Mark Garrett Cooper largely omits ‘conventional’cinematographic analysis in favour of a sociological approach -- the closing scene apparently ‘suggests that John finally fits in’and that it also ‘annuls the opposition between individual and mass with which it began’(83). In fact, the film includes the conventional ‘happy ending’despite its tragic dissolution of John’s ambition and desire to be different, and not to ‘fit in’. The closing scene is also cyclical in its situation of John within space, harking back to the opening of the film and representing visually a potentially downbeat (if ‘realistic’) conclusion -- John is still part of the crowd despite his desire to escape from it. So, despite his best efforts to coerce The Crowd to adapt to his polemic, the author only succeeds in making the reader rather dissatisfied with his analysis. In an interesting chapter on ‘Ethnic Management’, Mark Garrett Cooper’s desire for rhetoric at the expense of brevity and clarity again emerges- ‘sound that appears embodied locates itself in a space irreducible to the frame’(163) -- but his penchant for contentious statements is also present ‘‘to grasp The Jazz Singer‘s significance requires an appreciation for just how controversial Jewish identity was at the time’(175). So, the sound technology employed in the film and its fascinating use of Jolson as star are not as significant as this concept of Jewish identity? The film is remembered today as being (in crude terms) ‘the first sound film’(by this read: first film to include a portion of sound), not in terms of identity, Jewish or otherwise. Then, as Love Rules’ draws to its wordy conclusion, Mark Garrett Cooper describes the link often forged between films like The Cheat (DeMille, 1915) and the ‘low-key’Chiaroscuro lighting prevalent in German Expressionism through to Film Noir (interestingly side-stepping French poetic realism). Then, whilst the reader is still feeling a sense of injustice at this challenge to their rational thinking, the author astonishes with his statement that ‘in film appreciation classes’the Odessa Steps sequence of The Battleship Potemkin provides a staple example of ‘good’editing, quite apart from a consideration of why one might require montage to represent a revolution’(209), which makes one wonder exactly what he is trying to articulate. In attempting to sum up his arguments, Mark Garrett Cooper ultimately states that ‘It [Hollywood] represented a world that professionally trained specialists would necessarily vie to depict and order’(216), which is a fairly explicit reference to the Studio System and the dominant mode of production which would organise the production of films throughout the period the author in fact discusses until its breakdown following the Paramount Decrees in 1948. That the moguls who controlled the studios vied to depict ‘a world’in a fairly homogenous fashion as a white middle to upper class (the author would insert ‘managerial class’here, no doubt) heterosexual one is an interesting concept, but rather too monolithic. It is, in fact, like assuming that genre films follow a basic pattern that is repeated ad nauseam or that a star image like that of (for example) Rudolph Valentino could only be utilised to play a particular type of character. It is a dangerous avenue to assume aspects of film history are set in stone as monolithic creations, never changing and all forging one purpose. However, in his conclusion to Love Rules’ Mark Garrett Cooper does exactly that. 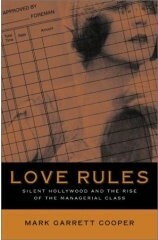 'Love Rules - Silent Hollywood and the Rise of the Managerial Class' is published by the University of Minnesota Press.